Ah, the delight of spring and summer months. You might be eager to dive into those carefree, halcyon days, but you’ll forgive your pet if he’s quite not ready to share in your enthusiasm. If he could talk, he’d probably tell you that he dreads the warm-weather flea and tick frenzy: the itching, the irritation, and, worst of all, possible infection or illness. Keep your beloved pet from becoming parasites’ most appealing, furry snack with the help of flea and tick preventatives and treatments. Consult your veterinarian to determine the safest option for your pet, and always follow the label instructions carefully. Monitor your pet after administering a flea or tick control product, especially if it’s a new addition to your arsenal. According to the AVMA, you should be on the lookout for these negative reactions: anxiousness, excessive itching or scratching, skin redness or swelling, vomiting, or abnormal behavior. If your pet has a bad reaction, immediately contact a veterinarian. Keep in mind that many flea and tick control products are not intended for the youngest puppies and kittens, nor elderly cats and dogs. In addition, not all products are safe for underweight, sick, medicated, pregnant, or nursing animals. If you have both a dog and a cat, resist the temptation to give them the same medication, unless the product is formulated specifically for both cats and dogs. Finally, know the weight of your pet, and pay careful attention to the dosage level. 1) Spot-ons refer to medications that are applied directly to the pet’s skin. The active ingredients will be released over several weeks’ time. Spot-ons are convenient to use, but you must exercise care: Seclude your dog from other pets and from children until the treatment has dried fully. Wear gloves, or wash your hands with soap and warm water after applying the medication. 2) Oral medications provide a simple alternative to topical treatments. Some will work to kill adult fleas and can treat sudden outbreaks and infestations. 3) Sprays and powders are inexpensive ways of controlling fleas and ticks. A powder is rubbed into the pet’s fur. Read all labels carefully, and monitor your pet for side effects. 4) Shampoos typically kill adult fleas on contact; however, they won’t usually stop an infestation or keep the fleas from returning. 5) Dips are concentrated liquids that are applied to the pet’s skin and left to dry. Dips should only be used on healthy, adult pets. Keep the dip away from your pet’s eyes and mouth, and take care to protect your eyes and skin. 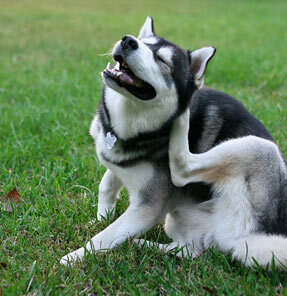 6) Flea collars repel fleas and sometimes ticks with a concentrated chemical. Monitor your pet for irritation or hair loss. If you’re looking for gentle ways to protect your pet during flea and tick season, consider some simple and natural home remedies. For a healthy, adult dog, PetMD suggests rubbing a freshly squeezed orange or lemon onto his fur, or bathing him with a gentle shampoo or citrus-based dish liquid. Tenacious though they may be, fleas are repelled by citrus. Another alternative is to apply rose geranium oil, a natural repellant, to your dog’s collar. PetMD cautions pet owners that this solution is for dogs only – not cats, who may have an adverse reaction to essential oils.